In July of 2000 the officers and members of the Southeast Antique Machinery Society (SEAMS) voted to join EDGE&TA during our yearly directors meeting. On August 23 of 2000 we officially became Branch 125. We will retain our original organization name along with the Early Days Gas Engine and Tractor Assoc. Branch 125 designation. The Southeast Antique Machinery Society is a chartered organization in the state of North Carolina. The group was incorporated as a nonprofit historical preservation organization on August 20, 1993. SEAMS first project was the procurement of the 1898 cotton compress in Charlotte NC. The Southern Railway funded the construction of the press in the late 1890’s so it could increase the amount of cotton shipped out of Charlotte to the ports of Wilmington and Moorhead City. The press would have been scraped in the early 1990’s to make room for a modern rail yard, but was saved by the efforts of the Southeast Antique Machinery Society. The Society has also taken on several smaller projects including the 350 hp 1905 Bates-Corliss reciprocating steam engine and the 1927 Skinner engine / generator set. SEAMS is based out of Denton, NC were the organization was originally formed by a group of collectors, exhibitors, and volunteers. Although the group calls Denton our headquarters, the members are spread out across the southeast. Our members hale from the states of North Carolina, South Carolina, Georgia, Tennessee, and Virginia. You are likely to run into a SEAMS / Branch 125 member if you attend shows in any of the states mentioned, but once a year you’ll find us all down in Denton on the 4th of July for the Southeast Old Threshers Reunion. Beginning this year SEAMS sponsored it’s first Steam School. The school is two days of classroom and hands on instruction on SAFETY and the care for and proper operation of steam equipment. This involves lubricating, firing and operating traction engines and portable boilers. The first class was a success and we look forward to putting on another early in 2001. It is an excellent class for those wanting to learn about steam equipment and it is very informative to those who already have some experience in this area. We hope to continue the school as long as there is interest to support it. Contact Branch officers listed above for more information on Branch 125 or attending or participating in branch events. 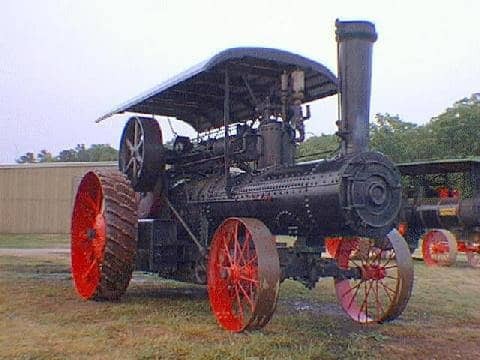 Frick Traction engine belonging to Joe Daugthridge of Raleigh, NC. Joe brings the Frick down to Denton for the Old Threshers Reunion every year and also does the village of yesteryear at the NC State Fair.